1. Gather your material. 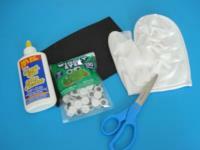 You will need an exfoliating bath glove, scissors, white glue and/or hot glue, black (or brown) Fun Foam, and a wiggly eye. 2. Cut the thumb off the exfoliating bath glove as shown. 3. 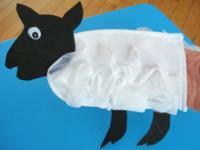 Cut two legs and your sheep's head out of the Fun Foam. 4. 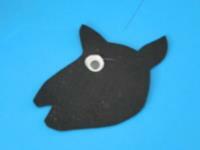 Glue the wiggly eye close to the ears. 5. 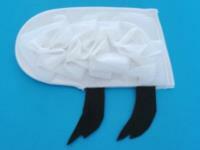 Glue the legs inside the bath glove (between the two layers) as shown. 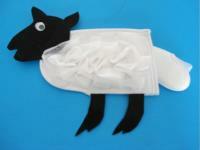 Seal the cut side of the glove with glue so children will be able to slide their hand inside the sheep's tummy. 6. 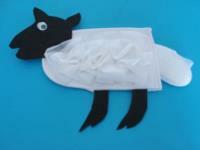 Glue the sheep's head on its body (top part of the glove). 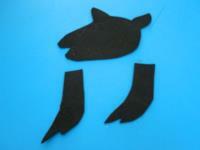 Use glue to stick the thumb (previously cut off) under the glove to represent its tail.